The Lower Elementary Classroom curriculum consists of a three year cycle for children ages 6 – 9. Hours for Elementary classes are 8 AM– 3:00 PM. Extended day is available from 7 AM– 6 PM. The Lower Elementary classroom is a multi-age environment covering 1st to 3rd grade. It is a sequenced learning environment, filled with beautiful Montessori materials as well as traditional learning resources like a library, computers, tablets, and other supportive technology. The Lower Elementary environment has a strong emphasis on time management skills. Students are taught to manage their time with daily, weekly, and long-term plans and projects. Each day, cooperative learning and care for the environment is expected. Language Arts in the Lower Elementary class is a time to learn the different rules of grammar, reading, literary devices, and beginning poetry. It is also when the students begin writing their own original poems and stories. The students begin working on reading comprehension and word study skills, as well as the rules of spelling. Mathematics is a time when the students perfect the four operations (addition, subtraction, multiplication, and division). Montessori math materials are used to encourage higher level thinking, as well as lay a tangible foundation upon which all future math skills will be laid. Students also become proficient in not only word problems, money, non-standard units of measure, fractions, and decimals, but also in geometric lessons like shapes, solids, lines, angles, area, perimeter, and volume. 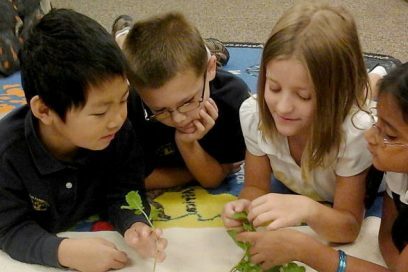 In the Lower Elementary classroom, culture lessons focus on History, Matter and Astronomy, Botany, Zoology, Culture Geography, and Physical Geography. In addition to the culture lessons, students work on Critical Thinking Skills, Coding and Robotics, Art, Music, and P.E. Please click here for an overview of the Lower Elementary Curriculum.